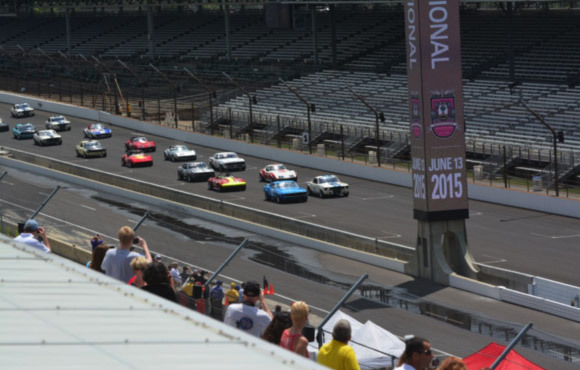 If anything, the Second Annual Brickyard Invitational was even more exciting than the first. 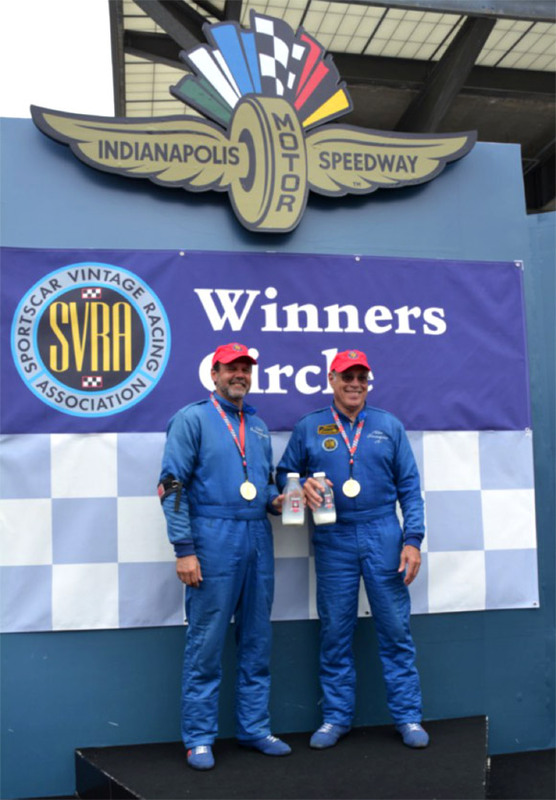 To what was already their biggest event of the year, SVRA added an Unser racing family reunion, an Indy Legends Pro-Am race, a Jaguar Driving Experience along with a world class auction, to solidify the event as one of the premier vintage motorsports events in the world. Duntov brought Rick Mancuso’s Corvette Grand Sport, Clair Schwendeman’s 68 Corvette as well as Tony Parella’s 71 Corvette, his 58 Corvette and his 1934 open wheel pre-war car. The weather forecast was iffy, but with only one exception it was not a factor; Saturday’s delayed start of the Celebrity Pro-Am being the only exception. Once again, Rick Mancuso was not able to attend due to other business commitments, and Alan Sevadjian was pressed into service as Rick’s back up driver. 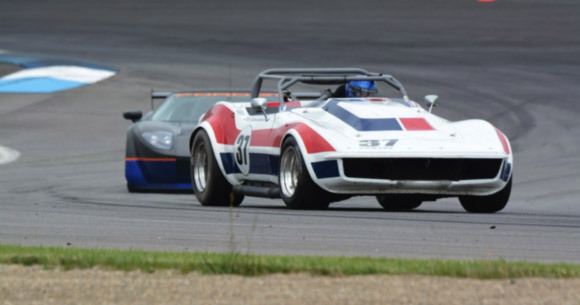 The Grand Sport runs in SVRA Group 5 with Can-Am cars and Lotus 23’s, as well as an assortment of similar era GT cars including GT40’s, Cheetah’s, etc. It is not a race group that a GT car can win overall, so we were content to run for the class win. The team was confident Rick’s Grand Sport was up to the challenge. The Pro-Am race gridded on pit lane at 1:00 Saturday, just as the skies unloaded. Virtually all the serious teams arrived at their grid positions on dry tires and changed to rain tires when it got very wet. The rain lasted 30 minutes and then the Indy track drying equipment took over for another 45 minutes. By the time the track was dry, everyone on the pit lane had changed back to dry tires! 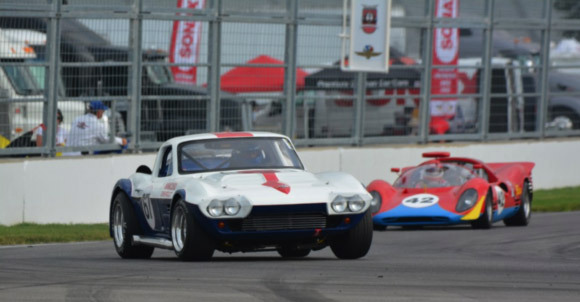 Just like last year, the Duntov team again ran Tony’s 71 Corvette. Edward’s qualifying session was his only session in the car prior to the race, and he ended up 10th. The plan was for Edward to drive until the first full course yellow and then hand it over to Ribbs. This was the same strategy as last year when Ribbs and Sevadjian finished third. The plan went south in the first turn when Edward was first rammed and turned around by an overly aggressive Mustang, and then tagged head-on by an innocent Corvette with nowhere to go. Edward came out of the first turn in 33rd place, but passed six cars on the first lap. The race ran quite a while before the first full course yellow, and Edward was up to 6th by the time he turned the car over to Willie T. That’s where they finished. The pole sitter, Curt Vogt had motored away from the field at the start but pitted under green, handing the win over to Texan Jim Caudle and Indy Pro Bob Lazier. As the Group 5 race was Saturday’s last race of the day, and as such it was an unfortunate victim of the Pro-Am rain delay. As the sun was setting on the speedway, the first lap drew a full course yellow after a racecar stopped on the racing surface. No sooner had that car been cleared than a second car, a GT40, coasted to a stop and another full course yellow was thrown after less than a half lap under green. This yellow brought out the pace car and after several slow laps the pace car driver picked up speed, pulled away from the leader and then turned his lights off and abruptly dived into the infield. The local corner worker simultaneously dropped his double yellow flags. The pole sitter either couldn’t or wouldn’t follow the pace car as it exited the oval. Instead, he stayed on the oval and went to full throttle between the Indy Oval Turns 1 and 2. The rest of the field followed in hot pursuit. Alan’s Grand Sport accelerated past 130 MPH through the Indy Oval’s banked Turn 1 and onto the front straight. 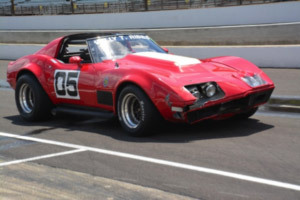 By the time the starter’s flag station was in visual range, the Grand Sport was at well over 160 MPH, just as the Can-Am cars in front stood on their brakes! Incredibly, the start finish flag stand was showing double yellows! Needless to say the lightweight sports racing cars stopped way faster than the GT cars, so the fans along the pit wall were treated to an exciting accordion effect as big cars blew past smaller cars, all with brake lights blazing. What a cluster! The beleaguered Competition Director called for a Black Flag All. By the time he had aired his complaints at the assembled drivers, there was no time for another restart, as it was now too dark to play. Everyone’s race was over before it really started. Afterwards, Alan said that in 50 years of racing, he had never seen such a screwed up race. Sunday’s 90 minute Historic GT-GTP enduro was our last race of the weekend. It was another case where we would be racing for the Class win (in this case the Group win) rather than the overall win. The field included a LeMans winning Audi as well as Indy cars, winged turbo Porsches, etc. There were 13 Group 6 cars out of 34 total starters. Again Clair and Alan would be sharing the No. 37 Corvette, with Alan starting and running until the first full course yellow. Alan had not driven Clair’s # 37 car at Indy prior driving it to the false grid. The #37 car was gridded one spot ahead of the XKE of Larry Ligas and his Le Mans winning co-driver Davey Jones. Larry’s Jag is always fast, and he is one of the best drivers and nicest guys in all of vintage racing. We couldn’t recall ever seeing him run the XKE in an enduro, although he often is a co-driver in other cars. Frankly, Clair and Alan rarely fail to win Group 6 enduros, but with Larry in his XKE with a world class co-driver, this was going to be anything but a cake walk! The race turned out to be largely decided on the second lap. A Corvette blew up big time on the front straight at about the braking zone for turn one. Race Control called for a full course yellow and almost everyone chose to pit. Alan did not. He made one more lap and then came in. In the mean time the pace car was called out and was gathering up the rest of the field. While Alan was sitting in the Duntov pit box waiting for the 5 minute pit timer, the pace car appeared on pit road, with the rest of the field in tow! Edward hurriedly gestured for Alan to go and he left the Duntov box, getting out just ahead of the pace car. At the far end of the pit road, pit exit was closed. Larry Ligas and everyone else who had pitted on that earlier lap sat waiting. Alan was right behind them, and right behind Alan was the pace car. Alan was already one lap ahead of Larry! The cleanup took about 30 minutes, after which pit lane opened. The cars ahead of the pace car raced around the track and caught up to the back of the field which was still being led by the pace car. This made almost another full lap on the field! By the first round of pit stops, Alan was up to 2nd overall, but the only important thing was ‘where is Larry?’, and Larry was still a lap down which is exactly where he finished. It could have been a hell of a 90 minute wheel to wheel race, but as it was, Alan and Clair were on cruise control and happy to get the historic win.